Sales of new cars in the UK fell for the fifth month in row during August, with demand for diesel cars plunging more than a fifth. There were 76,433 new car registration last month, the Society of Motor Manufacturers and Traders (SMMT) said. The figure was down 6.4% from August last year, while diesel sales – which have been hit by worries over air quality – fell by 21.3%. 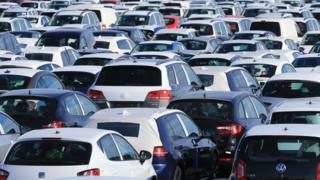 Several carmakers have launched trade-in and scrappage deals for UK buyers. Volkswagen, Toyota, Ford, Vauxhall and Renault are among a number of major carmakers that have launched schemes recently, which could boost sales during September. The SMMT said about 1.64 million new cars had been sold in 2017 so far, down 2.4% from last year. SMMT chief executive Mike Hawes said: “August is typically a quiet month for the new car market as consumers and businesses delay purchases until the arrival of the new number plate in September. Sales to private buyers were down 9.9% in August from a year earlier, while fleet sales dropped 3.2%. “August’s sharp fall in private registrations shows why dealers have suddenly launched scrappage schemes, ” said Samuel Tombs of Pantheon Microeconomics. However, he was sceptical whether the schemes would have any long-term impact. “In theory, these financial incentives could stem the downward trend in sales. But in many cases, the scrappage schemes replace discounts that were available to all buyers, and many owners of old cars might not be able to afford the monthly repayments for a new vehicle.